First of all: THANK GOD. Second of all: I’m glad she’s over it and I concur that we should get over it too. LOTR fans, I will gladly step aside as you sharpen your pitch forks. Anyhow, I can’t say I’m shocked or saddened to hear such news. As someone who was vehemently opposed to finishing any of her books, (The first one was given to me as gift and I couldn’t even get through the first chapter without wanting to punch myself in the face), I’m glad that they and the movies have finally been wrapped up. Me and my Twi-Hard friends usually don’t agree on much, but we do agree that Meyer‘s Twilight books definitely weren’t the best things ever. Hopefully, Meyers can find the right kind of success as a producer—she assumed that role for the last two Twilight films and The Host—for her company Fickle Fish Films. What do you think? Good news? Bad news? Sh*tty news? Sound off below! Tags: Books, E! 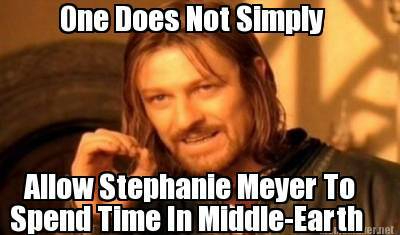 News, LOTR, Movies, News, Stephenie Meyer, Twilight, Twilight Saga. Bookmark the permalink.